Jiya: I know what you're doing. Rufus: What am I doing? Jiya: You're pushing me away. Jiya: My dad did the same thing when he thought he was going to die. It doesn't work you know. It just makes you look like a douche bag. 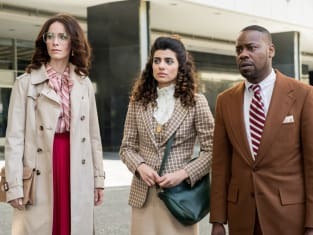 Timeless Season 2 Episode 8: "The Day Reagan Was Shot"
Lucy: OK. Enough. You've put brooding like a Real Housewife all week. Rufus: No, I haven't ... you watch the "Real Housewives?" Lucy: Yes, Rufus. Many people watch truly-awful-for-them-yet-delicious television. Permalink: Yes, Rufus. Many people watch truly-awful-for-them-yet-delicious television.